My husband and I are natives of Wisconsin, both grew up in central and northern Wisconsin, in 2002 we decided we needed a change and we decided to move to Montana, we lived in Superior and then up in Eureka, and now we’re in Butte, we’ve been in Montana 13 years. Last year I retired from public school teaching after a 30 year career in music education. Now I say “I’m retooled” cause I don’t like the word retired, so I’m retooled in Butte, I teach music in a private school and I do some freelance work and obviously I do some gardening too. My gardening experience was with my grandfather, I recall about age kindergarten. He was an organic gardener before it was cool to be an organic gardener. I remember one of my first jobs was to lay lime down, because the soil in Wisconsin is very acidic, so you needed lime to neutralize. I graduated to planting beans and corn and he showed me how to measure how to mark between the corns, using my hand to space the seeds and the rows and he a special shovel handle with the marking between the distance between rows. And he had like an acre of garden in this town, he gave most of it away when it produced. And I remember in the fall, when we’d harvest, we’d always have a big bon fire and roast hot dogs and marshmallows. Those are good memories for me. My husband and I notice that our garden produce tastes so much better then the items we find in the market. I like knowing where my vegetables come from, and even when we’re not growing vegetables here, we go to farmer’s market’s in the area and talk to the people that grow there, so we have a knowledge of where the food comes from. I also think gardening is king of a duty to being accountable to nature. We’re given so much, the earth gives us so much back, for us to give back to it by this cooperative production we do with gardening, it makes us aware that having just enough is enough to have abundance for us. We don’t have to have a mass marketed food supply, if we can grow what we need and have some to give away that’s enough for us. I try to use products like compost and manure. One of my friends turned us onto epsom salts for tomatoes and cucumbers. When you transplant tomatoes often times there is a wilt that happens with a transplant, and so the epsom salts provide extra magnesium which helps the cellular level of the plants to do do better in transplanting. They suggest one or two tablespoons per gallon of water, or just sprinkle around the base of the plants. I just tried it with some tomatoes I transplanted and there’s been no wilt. This is interesting because we bought our home in January when there was snow on the ground, didn’t really know what was out there. The wife was a master gardener, and she had some wonderful treasures in store for us this spring. A rhubarb plot, and had started some raspberries, had some herbs. Primarily a perennial flower grower, my grandfather always said, “you can’t eat flowers” so he was a vegetable gardener. I’m primarily a vegetable gardener. I know a little bit about flowers but not as much as about vegetables. The soil here was enriched, it kind of has alkaline like most of Montana does. The soil seems to be enriched well with bark, and compost, so I didn’t have to do much with the soil this spring. Kind of a crap shoot this year but everything I put in the ground, is up and seems to be growing well, and I ‘m hoping it’s gonna be a good year. It seems that leafy vegetables grow well as well as cabbage. There’s a couple of things, I want to start more plants indoors. I haven’t done much of that in the past, I usually rely on greenhouses or friends to start plants for me. I’d like to experiment with that, I’d like to try growing a vertical garden. I live in the city so I don’t have a lot of land space for a traditional horizontal garden so I’d like to start growing my garden up, using trellises and maybe some raised beds. Megan Cain recommends the Year Round Vegetable Gardener by Niki Jabbour in Episode 44 of the Organic Gardener Podcast. I’m gonna suspect it has to do with cucumbers though. I did start cucumbers in the house, and got some pretty good starts on them. I’m growing them in pots, using the bush variety this year. I’ve never had really good luck with growing cucumbers, it’s either too dry or too wet, but I’ve never grown them in the big pots before. So I’m gonna try that and see if I have good luck with that. When we lived in Eureka, we lived right at the (Canadian) border, we could grow cabbage like crazy, it was like magic soil up there. My cabbages down here are doing really well. That must be the plant that I channel, is cabbage. Salad greens generally go well, of course Montana’s soil seems to do well with those plants and we get the cool springs and the alkaline soil, so I think those do well here. I did plant kale, lettuce, spinach, and then this summer I’m gonna try swiss chard I have never grown that before, and bok choy. Something you would steer new gardeners away from that you find is typically challenging to grow in Montana. Here in butte you’re looking at frost almost any day of the year. Corn I really think it’s a moisture issue here. In some places more then a mile high, both Anaconda and Butte are over a mile high here, there about 20 miles apart. I have a habit of sowing seeds heavily, cause I’m always lived in climates where frost is issues. I just think there’s strength in numbers. I know you’re supposed to sow your seeds a little lighter, but I sow heavily. So I end up having to thin plants and I really don’t like to thin plants out. I’m always worried I’m gonna disturb a really good plant, and I think that’s a waste of plants, but they don’t really grow well unless you do. One of the things that was suggested to me was to sow my carrots with my radish seeds. So I bought 2 packets of radish seeds, to one packet of carrot seeds and I put them in an old spice jar that has the holes on top, and I broadcast them in a square plot. By doing that with the seeds and doing that and broadcasting it should spread the carrots out a little more I can still harvest the radishes early and get them out of there before the carrots are ready. I’ve never had a problem with pests and I think it’s got to do with getting rid of old or wilted vegetation that’s near the plant. So when, the tomato plants start to blossom early on, those blossoms of course are going to produce your tomatoes. But once your tomatoes start setting fruit, if there’s blossoms beyond that point, they should be pinched off so the energy of the growing goes into the tomatoes that are set, rather then the plant itself. My tomatoes usually get a haircut, when they start forming about an inch in diameter, I start clipping off all of those other blossoms by that point they’re not gonna probably set fruit much anymore and they’re just taking the energy out of that tomato. Plus getting that extra foliage out it’s gonna allow the sun to ripen the tomatoes on time. I love cleaning my garden at the end of the season. It’s kind of the closure activity, knowing that I ‘ll have a nice garden ready of spring so I don’t have to clean it in the spring. Of course eating the produce is awesome too! Probably in Eureka, the best crop of cabbages you have, we could grow cabbages like they were magic, they didn’t have any bugs in them no moths. I think everybody in our neighborhood got cabbages from us that year. I don’t know exactly what it is I think once the cabbages start forming, you need to get rid of those bottom leaves so that air can get around the bottom of the plant. You’ve got to get those out of there. It’s getting too wet, when the rain falls, it gets in there and thats what breeds the infestation of the bugs. We never really used pesticides. Keep the soil just moist enough for production, but not too wet, is a big factor in keeping those cabbages healthy. Last year the raspberry crop was amazing, I think a lot of that had to do with the previous winter, my grandfather said when you have a really cold winter that the raspberries do. Start small, don’t try to plant everything, start with things you’re going to eat the most and focus on those, if your a new gardener, I wouldn’t even start with a plot, I would start with some pots, see how you like doing gardening in a pot, it’s easy to handle, the weeding is way easier, you can watch the process easier. Start small. People say I’m gonna garden and dig up their whole lawn, and then they realize that was too much and they get discouraged and they stop. Start with crops that will grow in your area, and if you don’t know what that is, don’t be afraid to ask someone. I have a hand tool that is about a foot long, it has a dual top, it has a little mini hoe and like a three tine rake on the other. I use it for everything, I use it for weeding, and for transplanting. And when we moved to Butte I lost track of that tool for awhile, oh and I panicked because I couldn’t find it anywhere. Then I did find it, and it has a special place in my garden, where it hangs. I believe you should eat it in season because that’s when it’s most nutritious, hopefully you have neighbors that like vegetables. I’m a big proponent of freezing, of course you can’t freeze lettuce. My mother always canned but I never really liked the taste of canned vegetables, I‘ve learned how to blanch vegetables and freeze them. It goes back to this thing. What is abundance? Does it mean we grow enough to consume, or to share with our neighbors? I know people who grow so much, but they have no way to distribute it, it’s finding that happy balance, what is the purpose of my vegetable garden, is it for my family and neighbors? It sounds a little philosophical, if you are going to have more vegetables then you are going to consume immediately, is freezing and canning an option but, do you have the where-with-all to do that? 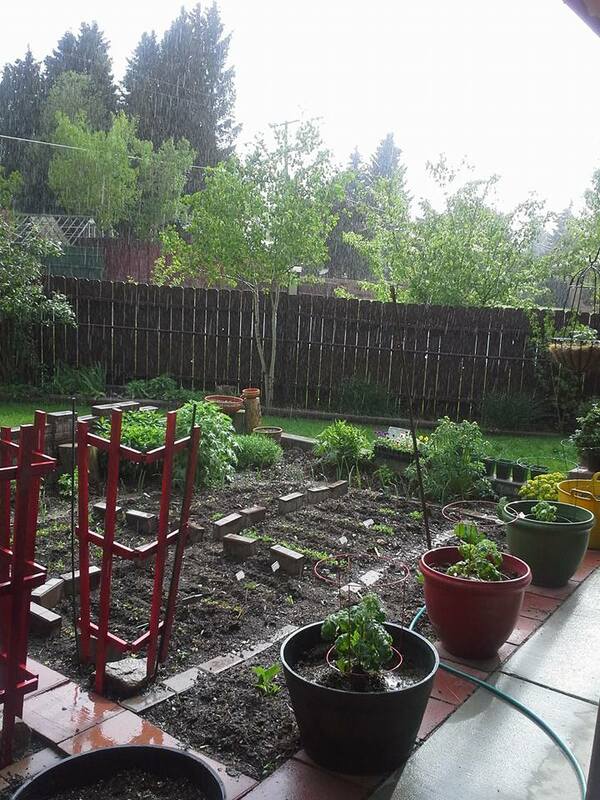 When I first started gardening, the first time we had land, when we first moved to Montana, we kinda went hog wild and grew everything. We grew things we didn’t even like. I like where I’m at and there’s two of us, and I’m more about zone gardening, we have a little bit, so there’s a little bit, so I don’t feel like I have to fill in this large space with stuff. It kind of goes back to our life philosophy. We have minimized our possessions over the last few years, living a simple life, we try not to accumulate a lot of earthly goods. and I think our garden reflects that. Lots of info on the internet or local extension office can provide you information. It’s a very easy process, the secret is once you blanch your food, you don’t have excess liquid in it once you pack your bags and holds the flavor. As far as fresh produce, it’s important don’t over wash food before you put it in the fridge. I don’t over-wash anything that goes in my vegetable bins. I have 2 vegetables bins, and I picked up a vegetable bin that sits open on one of my shelves because we have a lot of vegetables. I don’t wash them before I cook them for a meal because I think it takes away some of the plants nutrients. If you have produce in the fridge, make sure you take off any dead foliage. My favorite recipe is a wilted green salad, a hot oil and vinegar dressing, and red onion with the greens, you can add some bacon or ham or a vegetarian soy bacon bits, and put some cold sliced boiled eggs. I can’t wait our spinach is just about ready to pick. I just discovered this site recently, Earth Easy which is basically a page full of links on sustainable living, most of them are a type of garden links. Mostly practical things like how to build a tressel for you pole beans, how to know what type of soil you have. For the last few years my daughter has wanted to give me a subscription to This Old House Magazine and they usually have something on gardening. My husband and I recently are participating in a project, sponsored by the Historical Society where they take critical areas around town that have had trash and litter problems, that you adopt and keep clean. We decided we would adopt a 12 block area in our neighborhood. I was astounded at how much trash we picked up in the area, initially in the spring. The program actually ended officially on Memorial Day. They wanted to pick up everybody up for the spring time. We go out an walk every week. And we pick up one large garbage bag every week. People throwing things, beer bottles after bar-time, the wind is probably a contributing factor. I would like to see everybody who walks take a garbage bag with them and pick up the garbage on their walk and I think if everyone would do that it would be an enormous improvement on our environment. Garbage comes out any time, not just in the springtime. I’m gonna suggest this a project in our city. I’d like to address this specifically to women. In the world cultures, women and the earth are deeply connected, women have always had a special connection to the earth because the earth is the bearer of life. Everything that we grow comes from the earth, and women are bearer of life through the womb, and the garden feeds us women spiritually. For you women out there this is a really special hobby that you can take on, it will give you some peace because there’s probably some other people in your household that don’t want to garden and it will be your escape route.